Cloud vendors promise powerful resources at an attractive price and this has led many enterprises to consider migrating data and applications to cloud based architectures. Vendors also promise increased overall security thanks to the economies of scale which allow them to employ staff and technologies that offer greater security than a typical enterprise could justify. Yet many remain skeptical of the cloud when it comes to trusting a third party with precious data. At the same time, multi-tenant architectures housing data from multiple sources make clouds attractive targets for attackers. Combine this with the relative infancy of the platforms, running applications developed for entirely new architectures and this has raised many questions about cloud security. A panel of experts will discuss their own experiences and debate whether or not the cloud truly can be secure. 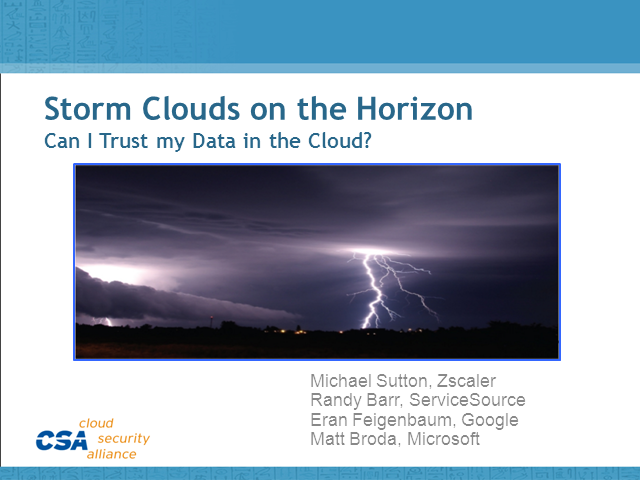 Title: Storm Clouds on the Horizon: Can I Trust My Data in the Cloud?